Ed Thometz found his dream job as a bridge inspector. Taka Kimura, P.E., F.SEI, M.ASCE, is a lead bridge engineer for CH2M in Honolulu, HI. Active in ASCE, he is a member of the Structural Engineering Institute’s Public Relations Committee, for which he has written a series of articles about dynamic structural engineers. 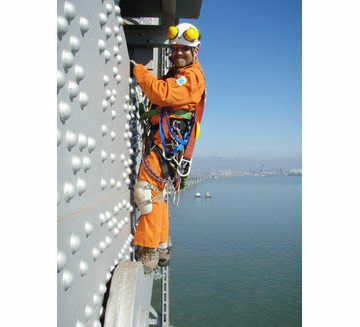 Ed Thometz, P.E., M.ASCE, has just about the best office view of any structural engineer in San Francisco. 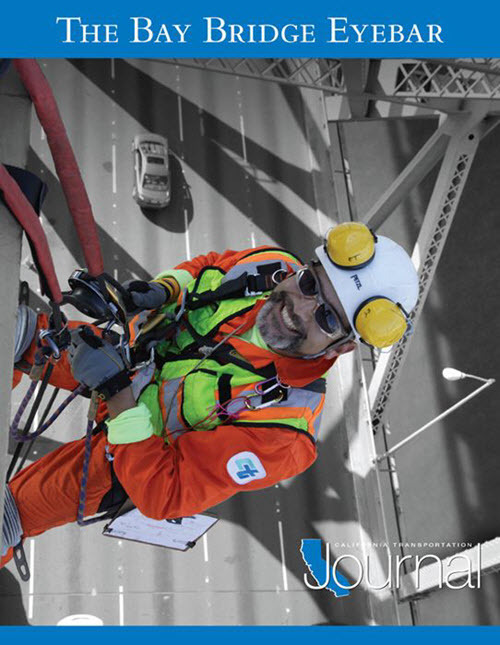 As the Area Bridge Maintenance Engineer of the recently completed San Francisco–Oakland Bay Bridge East Spans, it’s his job to ensure that the structure is properly inspected and maintained. Not an easy task for such a high-profile Bay Area landmark, but Ed loves his job nonetheless. Ed is well established in his current position, but his career has gone through numerous twists and turns to get there. His formal training started with a bachelor’s degree in civil engineering from California State University, Northridge and a master’s degree in civil engineering with a structural emphasis from Stanford University. One of his classmates at Stanford was Yoshi Takeuchi, who worked at Obayashi Corporation in Tokyo, Japan. After graduation, Mr. Takeuchi approached Ed with an opportunity to work at Obayashi in their Tokyo home office. Always up for an adventure, Ed gladly accepted the offer and spent the initial years of his career performing finite-element analysis for vulnerability studies of nuclear power facilities. His experience in Japan was professionally rewarding, but after spending almost four years there, Ed decided to move back to the United States. His primary reason was to seek a more “people person” job, but he had also gotten married to his wife, Asami, and I knew that he would like to start a family back in the States. Ed contacted Dr. Haresh Shah, former chairman of Stanford’s Department of Civil Engineering, and discovered that his son, Mihir, had a startup company in Silicon Valley and was searching for someone to manage relations with one of their largest clients, NTT Data. Ed took the job and moved back to California. After returning to the United States, Ed went to work for various companies that ranged from software development to risk management and precast panel production. Although the work was not structural engineering, Ed gained valuable managerial experience and excelled at each company. Despite his success, Ed always felt that each position he held was never a perfect fit. It seems that Ed has found that perfect fit in his current position with California’s Department of Transportation (Caltrans) bridge-inspection program. I caught up with Ed during a recent visit to San Francisco and found out more about what he does and how he got there. Kimura: How did you end up working at such a wide variety of jobs after you returned from Japan? Thometz: It sort of all just snowballed with that first step into the Stanford Management Group [soon to become Liquid Software]. I was employee No. 13 learning about data warehousing and integration. My focused role, initially, was to be the liaison for the company with NTT Data. But as with most startups, I soon wore many different hats at Liquid Software. After Liquid Software folded, I rolled over to Risk Management Solutions. Although an application development company, RMS develops risk models, and so I thought I’d at least be around some individuals with a similar background. But as time went on (over six years), I knew I did not want to continue that career. I did not know what was next up, but just knew I was not in it for the long haul. I took a couple months off after leaving RMS to do some soul-searching. On one of my cycling rides in my home area, I came across Walters & Wolf Precast. I got home, looked them up on the web, and noticed they had a project manager position open. I thought that maybe I could still enjoy project management if it was in the context of engineering; not software development. So I sent in my resume, and the same day I was contacted. A day later, I interviewed and received an offer. I had also received an offer from Caltrans, but I decided to go with Walters & Wolf Precast. However, in less than a year, I didn’t “feel it” and wanted something more fulfilling. Kimura: How did you find out about the bridge inspection position at Caltrans? Thometz: So during my time off to “soul-search,” I attended a Stanford Alumni Job Fair. Walking around the fair I noticed that Caltrans had a presence. I strolled up to their table and off to the side was a laptop running a slideshow that featured guys hanging off bridges with ropes. I had done a bit of mountaineering back then, and some light rock climbing, so the slides caught my attention. The two young engineers at the table explained the bridge inspection program and indicated that the team was in need of some more engineers with a desire to utilize rope access. I sent in my resume to the hiring supervisor and had an interview, and an immediate offer, but, after some reflection, decided to accept with Walters & Wolf Precast. Kimura: What made you decide to join the Caltrans bridge inspection group? Thometz: As I mentioned, I did not feel it with Walters & Wolf Precast and decided to shoot the Caltrans manager an email. He remembered me and had an opening. I took it, and I’m glad I did. I love being able to apply my structural engineering knowledge as I climb very large jungle gyms, as I so describe it to my friends outside of engineering. Kimura: Was it a tough transition? 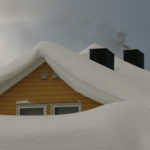 But my family and I weathered the storm, and over the past almost eight years, things have adjusted OK for us, and the fact that I begin every day with a smile about going to do my job is priceless. I really hope that my two sons will learn from life experience and seek careers that bring them the same joy that I have in my job. One other “tough” transition was having to study for the P.E. Ever since Obayashi, I never needed to have it, and hence never pursued it. But with Caltrans, an engineer needs their professional engineering license for any upward movement. So, being in my mid-40s, I took on the challenge. With a few attempts and persistence, I became a licensed professional engineer with the State of California. More than just getting the license, I was glad that my sons got to see firsthand that one is never too old to make a change, take on a challenge, and be a lifelong learner. … the fact that I begin every day with a smile about going to do my job is priceless. I really hope that my two sons will learn from life experience and seek careers that bring them the same joy that I have in my job. Kimura: What is the best part of your job? Thometz: No doubt about it, when I am hanging off of – literally – one of our SF Bay Area bridges, and it’s a sunny warm day, I am in hog heaven; best office view ever! In conjunction, I do enjoy having to work out solutions for issues that we find from time to time. Kimura: You must have seen some crazy things while you were out inspecting bridges. What are some of the most memorable? Thometz: Fortunately, our SF Bay Area bridges are in good shape, so I don’t really see crazy stuff from a deficiency point of view. That said, the infamous eye-bar crack found over the 2009 Labor Day Weekend on the San Francisco–Oakland Bay Bridge East Span (which was taken out of service in 2013), and the subsequent inspections of the repair will always rank up there. After the initial eye-bar repair, we had to inspect it daily via rope access techniques, which involved midday rolling lane closures allowing us access to the truss’s upper chord, and then deploy on ropes over live traffic to the eye-bar to take our field measurements. Another memorable time was of an inspection outside of the Bay Area. Our rope access team was called upon to provide assistance to inspect the timber piers of the Albion River Bridge, in Mendocino County. The timber deck truss bridge, which carries California State Route 1 traffic, provided our inspection team with wonderful views overlooking Albion Cove and beyond to the Pacific Ocean. Kimura: Any words of wisdom to designers on how to make their bridges more inspectable or maintainable? Thometz: Participate in some inspections of in-service bridges. See the bridges from an inspector’s point of view, and learn about the inspection obstacles we deal with. Kimura: Any advice for young engineers just starting out in their careers? Thometz: Your first job will not necessarily be your last, and in most cases will not. So get out there and discover, and in due time, you will find the job that you can do with passion. 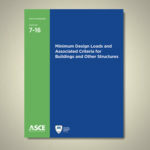 Learn more about ASCE’s Structural Engineering Institute. Very well written article about a government engineer passionate about his work ! I really enjoy reading articles, very informàtive.